Four Notre Dame Law School students from the LL.M. 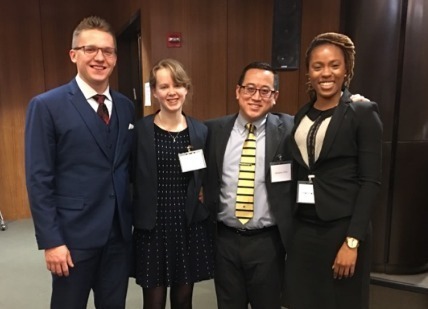 program in International Human Rights Law recently won the Americas regional round of the Price Media Law Moot Court Competition. 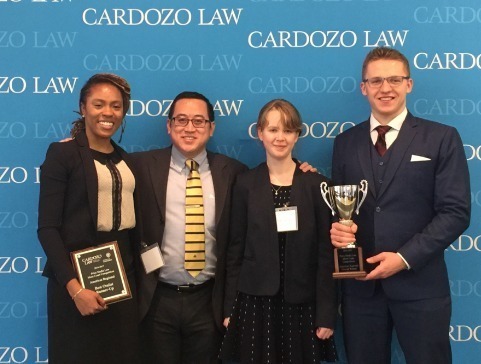 The team of Martins Birgelis (Latvia), Rachana Chhin (United States), Ruth Cormican (Ireland), and Jodi-Ann Quarrie (Jamaica) competed at Cardozo School of Law against several teams from across the Western Hemisphere on Jan. 25-29. They will move on to the final international round in April at Oxford University. Quarrie was named as runner-up to the best speaker for the competition. The team was coached by Paolo Carozza, professor of law, concurrent professor of political science and director of the Kellogg Institute for International Studies at the University of Notre Dame. The competitors argued a case concerning the applicability of the Universal Declaration of Human Rights, Article 19, which protects the universal freedom of expression. In the case, the government of a fictitious country prosecutes a journalist and blogger for the publication of a politically sensitive column, a violation of the Stability and Integrity Act of 2014. The case further involves the government’s subsequent order to a social media internet provider to remove specific content from their site. “The competition was an absolutely phenomenal experience,” Chhin said. “I am grateful to my teammates for their many tireless nights of hard work and encouragement to get this far. It was an honor to represent Notre Dame and win at the regional rounds. The team was sponsored by the Center for Civil and Human Rights, the Program on Constitutional Structure, and the Program on Church, State & Society.